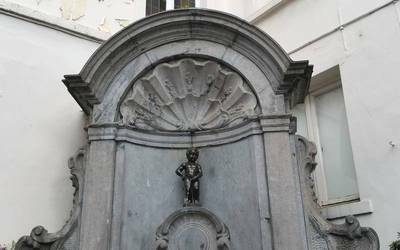 The Manneken Pis is the name given to the pretty little fountain depicting a child who is urinating. It is the symbol of Brussels, the city that houses it. It is so famous worldwide that it has become the symbol of all Belgium. And yet, at first, there is no reason to say that she had what it takes to get such popularity: Rather small, it blends into the urban landscape of Brussels. But her story has taken her as a representative of the Belgian people, and as such she has gained that great popularity she enjoys today. 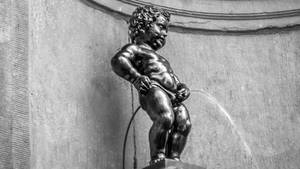 This website proposes to discover the Manneken Pis. First, let's see where she is, exactly. The Manneken Pis is right in the center of Brussels, the Belgian capital. It is a hundred meters from the main square, this beautiful square, heart of the city, which is lined with beautiful facades. There is the King's House which houses the City Museum. He owns the real Manneken Pis, because the one on the street is a copy. Learn more about his adress, his location. The Manneken Pis is rather small, it is usually a surprise when you see it for the first time. It measures only 55.5cm high. when to its weight and the price it cost ... see below. Lear more about his dimensions, the weight and the cost of the Manneken Pis. The Manneken Pis is one of the most copied monuments in the world. It must be said that a statue of a naked child who is urinating, especially in the form of a fountain, is not very original. But you have to distinguish the official copies from the others. Indeed, the official copies are replicas offered by the city of Brussels to other cities, as a sign of friendship. They are distinguished by the quality of the copy, of course, but also by the fact that they are usually exhibited in symbolic places. The other copies are simpler, of course. And the country best represented in terms of number of copies is ... Japan! Lear more about the copies. Did you know that Manneken Pis is a fashion-victim? It has more than 1,000 outfits, most of which date back to the 20th century. We continue to offer it at a rate that is sometimes never worn. There are some for everything, offered for all reasons. To celebrate the folklore of a distant country, to commemorate a historical event, to highlight a discovery, a technological advance, medical, to honor a personality, etc. It is therefore very common that when approaching the statue, one finds it dressed with clothes which have nothing to do with the local folklore! Lear more about the costums of the Manneken Pis. Want to see some pictures? Or to read funny anecdotes about the Manneken Pis? It's here ! The pictures and the anecdotes. But this site also presents a full description of the famous Belgian statue as well as its history, from conception to the present day.